My parents used to tell me the horror stories when they were younger about their experiences in car seat education safety. One experience that always made me happy that we now live in a more modern world now than what they had to experience with little education about car seats. My parents vividly remember the day they practiced putting me in the car seat for the first time while trying to gently maneuver my wiggling and all my squirming, uncooperative limbs into the seat and discovering that the straps were way too tight. Out I came again as they struggled to work out how on earth to loosen the car seat straps. All while being watched by a gang of highly amused, not-first-time parents who were sitting nearby. Eventually (after much heated debate and reference to the instruction manual) they were able to put me in the car seat, secure and we could set off for home…albeit with me sitting beside her in the backseat and Dad driving at about 10 miles an hour! We’ve come a long way with car safety in the last 30 years! My grandparents remember as a child being squished in to the one station wagon with their cousins when they visited, 2 kids to a seat belt, 5 across the back plus 2 in the trunk area. When a policeman drove by my grandparents would yell “duck” and the kids in the boot or trunk area plus two of them in the back seat would squash down and hide below the window level. This was the 50’s and they had no air conditioning, so if it was hot they had to open the windows. Then my grandparents driving along with one hand on the wheel and a cigarette in the other would tap the cigarette on the window’s edge and it would all fly back in the back window with a stinky stream of smoke. 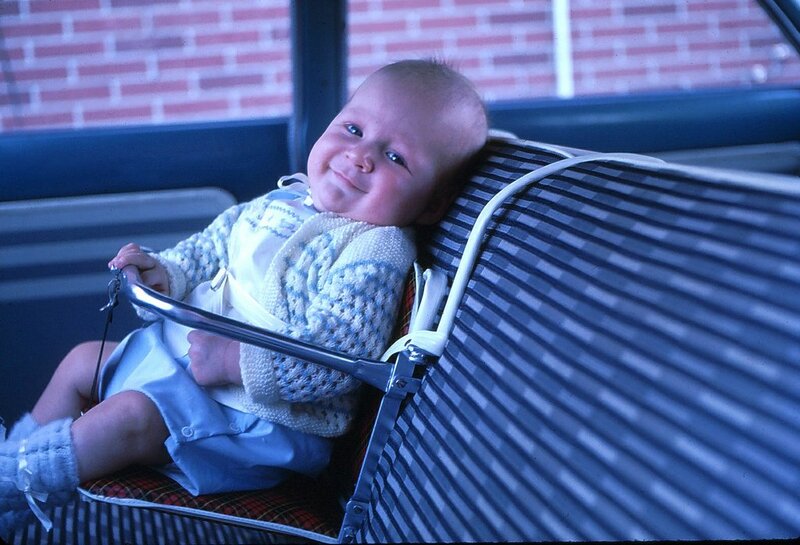 The design of the car seat has come a long way since its creation. Initially the car seat was simply essentially a booster seat parents could use to keep an eye on their child when driving. There was not much of a safety factor to consider. As years went on, the government adopted safety guidelines for manufacturers to abide by to make a car seat safe for children. These rules change from time to time as car seats continue to improve in design and phasing out or recalling cart seats that no longer meet the specifications of the National Highway Traffic Safety Administration. Parents have a variety of innovative tools today for car seats, or carriers that may have not been needed in the past. In the past, a parent would rely on word of mouth from family or friends on what car seat they use and how safe, effective and easy they are setting up. Nowadays people have the luxury of social media, and internet to actively search cart seats that will fit their vehicle and fulfill their needs. People can read reviews on their phones from independent agencies such as Consumer reports or see which car seat scored highest in the safety category from the Juvenile Products Manufacturers Association while at the store shopping. Smart phones have made the ease to access information faster. Before purchasing a car seat, parents can use mobile car safety apps to search for car seat recalls. Once purchased, parents should register the car seat with the company to ensure that they are notified immediately of any future recalls. This is helping parents rely more on technology when deciding on a safe car seat or even knowing about when a car seat has been recalled, and then they can have it replaced immediately. Another tool of education that benefits the parent are the facilities that offer training on installing a car seat. Taking the time to research and find the best car seat means nothing if it is not installed correctly. Although instructions come with the car seat, some parents believe it simply sits in the back seat of a car which is not the case. Incorrect installation of a car seat can injury a child. Facilities such as local hospitals or Red Cross hold classes showing parents how to properly install their car seat to ensure proper fit. This also allows facilities to provide free inspections to ensure the cart seat meets the national safety guidelines as well as checking to ensure it is not faulty or part of a recall. The next innovative tool parents need today is the use of a combination stroller, car seat carrier. In this day of busy life schedules with activities and both parents working, kids are in and out of cars frequently. Having a car seat, the will withstand kids, and usage is important. The devices are designed to allow parents minimal purchasing of equipment and also getting full utilization of one piece of equipment instead of having to purchase multiple items. The cost for adequately caring for a child has increased over the years and in an effort to allow parents the ability to get the most “bang for their buck,” companies have combined carriers and strollers allowing parents to purchase one item and utilizing it in many forms instead of buying separate items. The benefit of this logic is parents can purchase a combination carrier stroller that allows them to use the carrier in the car, then rather trying to carry the car seat out, they can attach it to a stroller or wheeled carrier it comes with to be versatile for travel. This is efficient for the parent and safe for the child as this reduces the chances of dropping while carrying the car seat. Since cars come in all sizes, having a combination stroller and carrier allowing a parent to install the car seat in the back while folding the remaining and putting it safely in the trunk makes the equipment readily available for use when you get to your destination. Another benefit this has is a parent usually will have a diaper bag and or toys they need to bring with them. The combination carrier car seat has storage allowing them to put everything into one mobile device for transport rather than having to make several trips back and forth from the car or the house. Again, safety behind this is having everything there including your child will allow the parent to focus on what is important; their child. Another benefit for the combination carrier car seat is the car seat is with the parent when traveling. Rather than hope there is a car seat at the destination a parent is going such as while on vacation or if renting a car, having the correct size car seat can be challenging. Rather than hoping the right car seat is found for their use, this enables parents to have their own seat with them reducing stress. Another benefit of this is children are usually more comfortable in their own seats because it is familiar to them. The last benefit of having a combination stroller car seat carrier is less equipment to purchase. If a parent purchases a combination carrier stroller and is able to get years of usage out of it. It is a huge benefit. For example, purchasing a car seat that you can attach to the stroller for transport, then as their child gets older, are able to use the stroller for transport, the parent does not have to purchase an additional stroller or a child seat as a child grows. A few changes in the multipurpose stroller car seat is a financial savings for the parent and also an important safety piece of equipment. Raising a child in this modern age has changed over the years. Companies continue to strive for improvement in the field of child safety. As automobiles change and material used for vehicles evolve, passenger safety has to change. With that, the need for car seat safety must change also. Having a multipurpose car seat and stroller is not about having the latest and greatest model as a statement of success. A multiuse piece of equipment that enables a parent to safely transport their child and all the necessary items to and from home is critical for all parents. Developing such equipment and keeping the cost so consumers are able to afford these products is important. Undeveloped countries do not have the regulation governing them on child safety nor the consumer have the monetary means to purchase such items. This puts the child at risk. Fortunately, in this day and age, government oversight is important for safe traveling in vehicles and more so for small children. In the past, the need for a multiuse car seat and stroller was not thought of. As we continue to advance, and move forward with our busy lives, statistics will show the need for additional safety or improved equipment for transporting children will continue. The combination car seat stroller is a marvel for any parent. Something that was ahead of its time.